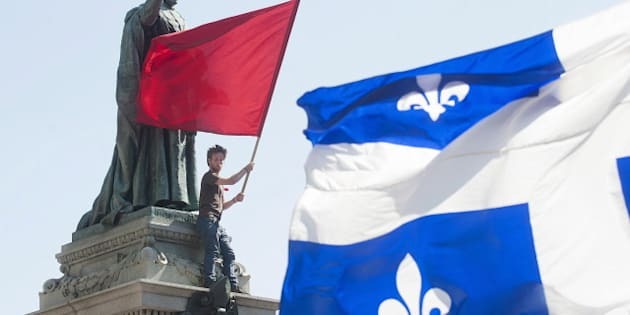 MONTREAL - Quebec's controversial back-to-school law was wielded for the first time ever by Montreal police after showdowns involving masked protesters disrupted the reopening of universities Monday. Authorities opened investigations into 19 people at Universite de Montreal for allegedly violating provisions of Bill 78, a police spokesman said. The announcement came on the first day of university as crowds of demonstrators entered classrooms, noisily banging on pots, pulling fire alarms and blowing on air horns while ordering students to leave. At Universite du Quebec a Montreal, in particular, the crowds worked their way from one room to another, emptying classes in any faculty that had voted to keep striking. That led to confrontations with security, staff and those students who wanted to study. In one incident, a grey-haired teacher physically shoved back a group of masked protesters and kept them from entering his class. Several other teachers simply cancelled courses amid the cacophony. In at least one case, a class was suspended when the students didn't show up. The numerous class cancellations marred the first day of school in those university faculties that were returning after having their winter semester aborted by an anti-tuition strike. In an effort to quell the unrest in the spring, the Liberal government passed Bill 78 which paused the semester for those Quebec students, about one-third of them, who were on strike at the time. The legislation also required demonstrators to show police their itinerary eight hours in advance, and it set out stiff penalties for protesters who block schools. Critics have slammed the legislation for infringing on the right to protest and call it unconstitutional. It faces several court challenges. But now with schools opening — and with one week left in a provincial election campaign — Montreal police have for the first time taken steps to charge people under the law. "It is the first time that people have been detained under that law," Cmdr. Ian Lafreniere said in an interview. "These people have been released with no conditions. They received a paper mentioning they are under investigation with Law 12 (Bill 78)." Lafreniere said police also arrested another person for assaulting an officer. Riot police entered Universite de Montreal after dozens of people wearing masks staged protests inside the school. While the demonstrators also disrupted classes at UQAM, the administration there did not ask police to intervene. Monday's events occurred in a charged political atmosphere. With a provincial election approaching on Sept. 4, many had expected ongoing student unrest to play a major role in the campaign. But the crisis had barely registered as an election issue amid a lull in the unrest. The vast majority of Quebec's students have already voted to end their strikes and, at junior colleges, the return to class has been peaceful in recent weeks. But Monday's scenes, as universities reopened, provided a flashback to events that captured international attention last spring. Protesters sounded determined to keep defying Premier Jean Charest's emergency law. "There are more than 1,000 classes to suspend at UQAM this week and we'll be there at the door of every one," said Alexandre Poulin, speaking for the arts faculty student association at UQAM, the main flashpoint of Monday's events. Across town at the Universite de Montreal, a standoff erupted in the corridors between security guards and demonstrators. The protesters unsuccessfully tried to free seven comrades who had been cornered in a fourth-floor classroom. During the showdown, lines of guards stood shoulder to shoulder to block a hallway. They kept a couple of dozen protesters, most wearing masks, from getting close to the classroom where detained demonstrators were being held. The guards faced a barrage of shouts and a couple of plastic garbage cans were tossed in their direction. At one point, the protesters held a vote about whether to charge the guards. The group decided against rushing the line when only around half of the people in the huddle raised their hands in agreement. When word spread that riot police had entered the building, the protesters scattered. A fire alarm was also pulled, its sound wailing even into classrooms in departments not involved in the conflict. One protester, who said he was caught between security staff and angry demonstrators, sported several red finger marks on his neck. "A security guard grabbed me by the throat and pushed me," Marc-Antoine Bergeron said outside the school after the confrontation. "It's really intense because there's so much negative energy." Bergeron, a UQAM philosophy student who headed to Universite de Montreal to support protesters there, said he wasn't afraid of getting arrested for something he believes so strongly in. "There's an opinion that the students are too hard, which is not completely false, but I think it's completely justified," said Bergeron, who shed a tear after protesters failed to release their peers from the classroom. Demonstrators in both universities confronted camera-toting journalists to voice their concern that they could be arrested for violating Bill 78 if their faces appeared in any images. Two protesters, their faces covered with clothing, warned a news photographer that he had better not try taking pictures of them: "Be careful," a woman told him at Universite de Montreal. "They're going to take care of you." It was a similar scene at UQAM's downtown campus, where masked demonstrators disrupted classes. Protesters blocked cameras and one person taunted a reporter: "It's voyeurism," the demonstrator muttered when a journalist tried gathering images. At UQAM, small groups of the protesters, armed with lists, were seeking out classrooms in faculties where students voted to remain on strike. They interrupted classes by shouting and shutting off the lights. Dozens of classes were cancelled. Several professors attested to being in a difficult position. One professor, who teaches students from departments that are on strike and others that aren't, summed up his dilemma. "I was hoping that either everyone would show up, or no one would show up — so I wouldn't have to make the decision whether to teach or not," said the professor, who declined to provide his name. "If three students showed up, should I still have the class?" As it turned out, when masked students barged into his class shortly after 9 a.m., he was there by himself and the class had been cancelled. In one psychology class at UQAM, a protester attempted to convince another student of the democratic legitimacy of the disruption. The actions, he explained, came after legitimate strike votes were held by student associations. "We're only disrupting classes in departments that voted to strike," he said. But the student simply turned her back on the protester. The striking students continued to bang on desks and blew an air horn until the professor raised his hands in frustration and cancelled the class. Several striking students carried a flyer that listed the departments that voted to continue their strike. On the back of the flyer there are spots for taking down names, the programs and email addresses of students who defy picket lines. In one class, a student rolled his eyes and tossed his hands up in frustration as he walked out of class with five protesters behind him. In another class, a teacher physically confronted protesters who tried to barge in and managed to complete the session as planned.